Phoenix’s journey began in 1994 in 12-step recovery after serving as an Airborne Medic in the U.S. Army. 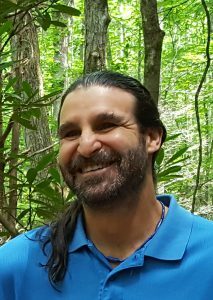 He is a certified Shadow Work®, Shamanic Breathwork™, Higher Alignment and Inner Empathy Coach/Facilitator and creator of the Evolutionary Life School. Phoenix matches individuals with compatible romantic partners, teaches skills to couples to uplift their relationships, and facilitates groups and business wanting synergy, flow and peak performance. He offers tools for self-forgiveness and letting go, so you can discover your authentic nature and live your life on purpose. He is a father, farmer, licensed massage therapist and energy healer. He and his partner, Avianna, co-own Blossom & Be Wellness Retreat in Asheville, North Carolina. With solid presence and as a catalyst for transformation, Phoenix creates a world of health, harmony and well-being.